Scientific Name: Ophiophagus hannah, Naja hannah, Naja bungarus. Other Common Names: Hamadryad. Ophiophagus hannah, Naja hannah, Naja bungarus. Himalayan region, Bengal, Assam, and hills and forests of South India. The king cobra is a forest dweller primarily, but also inhabits mangrove, and occasionally tea and coffee estates. It feeds on other snakes, and is rarely encountered. 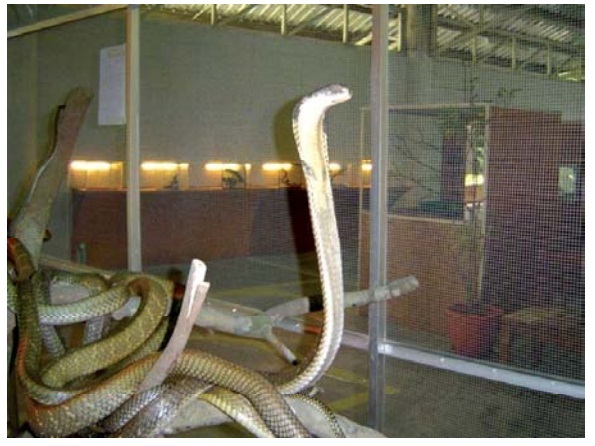 · The king cobra is the largest venomous snake in the world, and grows up to 8 to 12 feet or more in length (Fig 12.10). · Like the common cobra, it has a hood, but lacks the mono-cellate or binocellate marking; the hood is much narrower than that of the common cobra. · Colour varies from yellow to green, brown, or black. · The head has two large occipital shields behind the pari-etals. This is a unique feature of this species. The 3rd supralabial touches the eye and nose shield as in the case of the common cobra, but cuneate is absent. · Predominantly neurotoxic. However, according to some reports they may be able to produce haemorrhagic activity also.